How would you like to turn your little Troopers into cute bunnies this Easter? Little Troopers has the perfect solution to answer the moans of “I’m bored” this holiday. Our Crafty Little Troopers section has over 35 activities to keep your little ones busy and three have an Easter theme. You could get your little ones busy creating a gorgeous Easter egg wreath for your door or cooking up some chocolate crispy nests with yummy mini eggs in the kitchen. Our favourite is the cute bunny ears activity. It is so easy all you need is a piece of card that will go around your child’s head, some Sellotape and colouring pens or pencils. 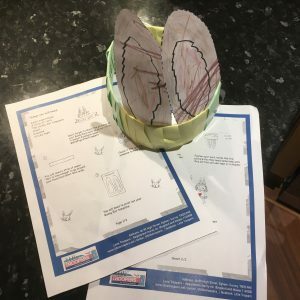 The crafty activity sheets tell you everything you need and give easy to follow directions to help you make your own creations. You can find them all here.